So this past week was rather awful. Sure, there were hiccups. Unpleasant behaviors we were dealing with. But seemingly overnight last weekend, all three kids’ issues intensified simultaneously. We tried being patient and non-judgmental and nurtur-y. After days on end of feeling like I was under siege, I cracked. And then I remembered the suckiest of sucky truths about life. Also the Main Truth about Life. The ONLY THING we get to control is our choices. That’s it. Just that ONE thing. Today I read this blog post by Renegade Mama which hit really close to home. That when my kids act out, I don’t have control over them. I can guide. I can direct. I can blame them and try to force them to change. Or I can recognize that they’re four. And still so, so little. And maybe they just need more snuggle time, more attention from me, more stability and assurance that even though they make bad choices that I still love them. Because for a little while there, I didn’t feel that unconditional love toward them. I was pissed at them. Pissed for making me so agitated, pissed for giving me insomnia, pissed for being so emotionally exhausting. Pissed because I have needs too and even if I didn’t, maybe there’s no way I could ever give them everything they need. That’s a hard place to be, and I find myself there from time to time. Trying to meet my needs, including time away from my kids. To exercise. To think. To read and write and connect with friends and fill those parts of my soul that get depleted. And trying to meet my kids’ needs when sometimes I’m not even sure what their needs are other than that they express those needs through biting, and shoving, and yelling. I can meet my needs or my kids’ needs but not both all the time. Sometimes one set has to be sacrificed. And that’s what I signed up for, I understand, but man, such a choice is hardhardhard. So while my students took their final exam today, I breathed and wrote myself reminders about these hard-won lessons that would be so much easier if I just had to learn them ONCE and be done: Respond, don’t react. Focus on the good. Low expectations, high acceptance. And then I came home on this gorgeous sunny June afternoon and we played a silly game of “Drive the Fire Truck.” They stamped while I made dinner. 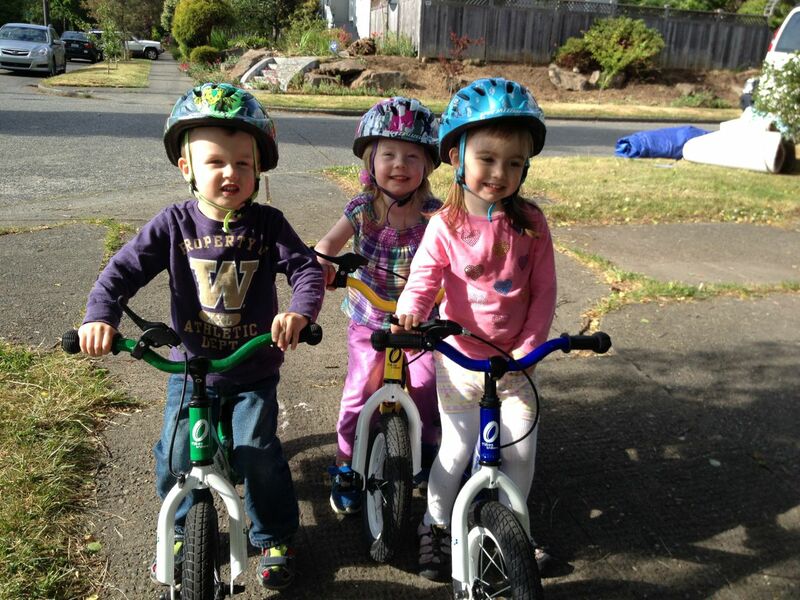 We rode bikes outside. It was lovely. The storm seems to have passed, for the moment.